Recently refurbished cozy 1 bedroom apartment with a private terrace. On the first floor without elevator, facing the inner side of the building. Very quiet and bright, with all the comforts. 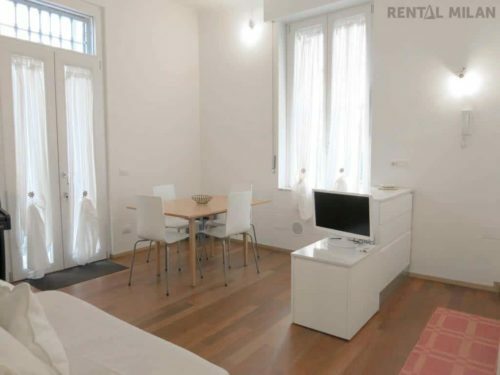 Living room with a sofa bed, table and chairs, a bookcase, an electric piano and a modern white fully equipped kitchen with dish washer and electric oven. Bedroom with a double bed (a futon over a bed structure with wooden slats) and a spacious wardrobe. Bathroom with shower / tub and window. Washing machine, AC, optical fiber high speed internet connection. Shops, services and public transports are walking distance. Cool bars and typical restaurants as well. The city center is just 15 minutes directly by tram. It’s 10 minutes walking from via Tortona, the heart of the International Design and Furniture exhibition.